This public service announcement has been brought to you by the Center for Not Being Annoyed at Your E-Book Reader. As an aside, I absolutely adore my Kindle. I use it on my train ride and at lunch pretty much every day. 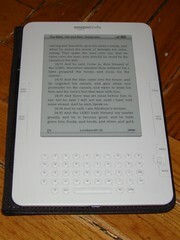 I thought that I might regret not having the Kindle DX with it's bigger screen but the Kindle 2 is the perfect size. And Whispernet+real books from Amazon is a killer feature. Being able to actually get books, unsurprisingly, makes me read more. I'd just like it more if, you know, it never crashed.